From a discreet, incognito standee to a playful metal addition, our top seven bookend picks will help you keep those tumbling books at bay! 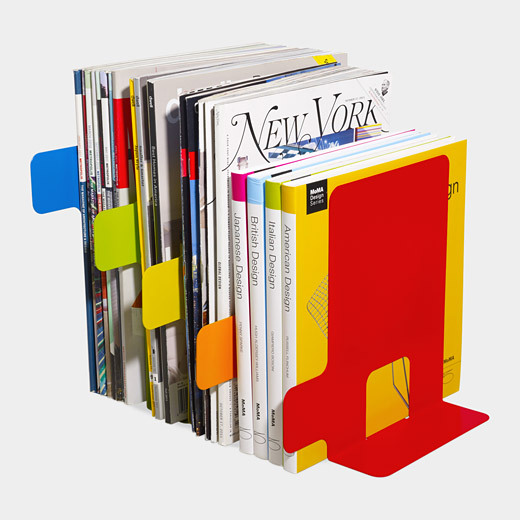 These powder-coated steel bookends by Hiroaki Watanabe ($25) will not only add bright pops of color, but allow you to easily organize and sort all kinds of reads such as magazines, books, and journals, by type. Product designer Alan Wisniewski's discreet Lena Bookends ($88) are the perfect landing spot for leaning books. Made from solid wood and sophisticatedly coated with a high gloss finish. Connecticut-based illustration and design team Gluekit can now add product designer to their repertoire. Their powder coated steel Stacked Brick Bookends ($39) would be a red-hot addition to any bookshelf or desktop. Whether you have four hardbacks or the complete collection of French literature, this set of Bendit Bookends ($28) will playfully bend and curve to any liking, all while gently holding those books in place. Add a playful touch with these sleek high-polished nickle elephant bookends by Philippi. Running low on books? Easily join the two pieces together for a complete animal shape. These glossy-finished steel bookends by Klaus Hackl for Eno Paris ($138) will help make your office desk a little tidier—the bottom tray can be used to hold all sorts of knick knacks, like paperclips, bonbons, and Whiteout. Available in red and black. Add a bit of a sculptural element with these solid acacia bottle bookends ($80) designed by Alan Wisniewski for Umbra. Comes in a set of two.